*The wages of sin is death. Repent before payday. *Under same management for over 2000 years. *Forbidden fruit creates many jams. *If you do not want to reap the fruits of sin, stay out of the devil’s orchard. *Tithe if you love Jesus! Anyone can honk! *Adam and Eve had an ideal marriage. He didn’t have to hear about all the men she could have married, and she didn’t have to hear about the way his mother cooked. Christmas Cookies – The Twelve Days of Christmas in Three! Done and Ready in Three! No matter how much time you seemed to have in September, you suddenly find your minutes counted and Christmas facing you in less than three weeks. Your dreams of “sugar plums” are reduced to a package of cookies from a grocery store shelf. With a little planning, however, you can fill the family cookie jar for the holidays and still have plenty to share. The best way to start a baking adventure is to inventory your cupboards to see what you already have on hand. The cookies use pretty basic items which you probably use on a daily basis, anyway. It isn’t much fun to start a baking project only to find something is missing. Kind of takes the joy out of the day if you have to tear off to the grocery store in the middle of your Christmas baking. Preliminaries: The Grocery check list! Combine the first four ingredients in a bowl and set aside. In a pan over low heat, melt the butter, letting it simmer but avoid burning. Add the brown sugar and beat it until well mixed. Let cool before adding egg, beating vigorously until smooth. Add vanilla and flour mixture until well combined. Form dough into two logs, about 2 inches in diameter. Wrap them in wax paper and refrigerate about 30 minutes, then shape them into smoother, more even rolls. Freeze for two hours. Preheat oven to 375 degrees. Remove rolls from freezer and slice into ¼ inch thick cookies. Place about 2 inches apart on ungreased cookie sheets. Bake for approximately ten minutes or until just golden. Cool and store in airtight container for one week or freeze for up to 2 months. While your Butterscotch Cookies are freezing . . .
Confectioners’ sugar, Juice and grated rind of one lemon. Preheat oven to 350 degrees. Generously grease an 8 x 10-inch baking pan, dust it lightly with flour. In a large mixing bowl, add the eggs, one at a time to the brown sugar, beating well after each addition. Stir in the candied fruit, spices. Into another bowl combine the flour and baking soda. Add the dry ingredients to the egg mixture, combining well. Spread the cookie batter into the prepared pan and bake it for 15 minutes or until deep, golden brown. While it is baking, add lemon rind, juice and enough confectioners’ sugar to make a thick icing. Spread over the warm cookies. When icing has set, cut into serving size squares. ½ cup chopped, drained, maraschino cherries. 1 cup confectioners’ sugar for coating. Sift together flour, cocoa, coffee powder. Gradually add to creamed mixture. Blend in nuts and cherries; chill until easy to handle dough. Shape dough into one-inch balls and place 1 inch apart on ungreased baking sheet. Bake at 325 degrees for 20 minutes. 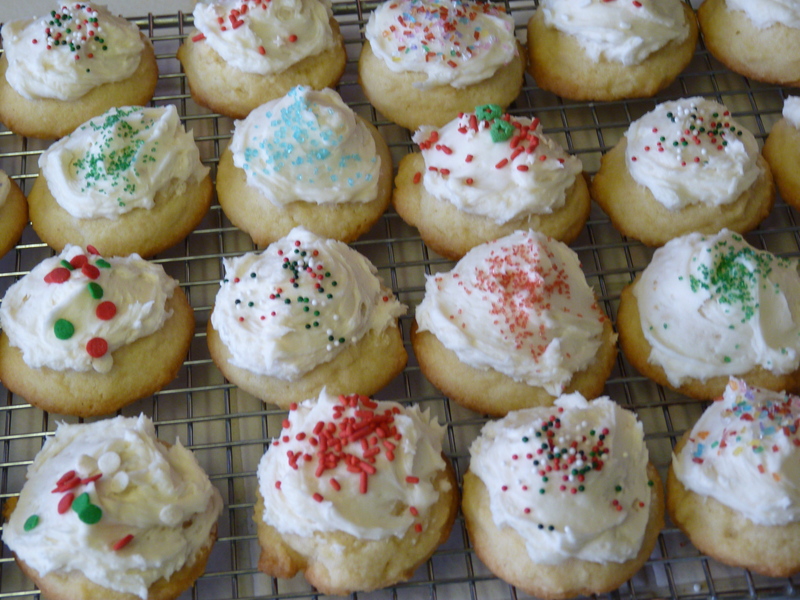 Remove cookies to cooling racks and, while still warm, roll in confectioners’ sugar. While your Fiesta cookies are firming up in the refrigerator, get started on . . .
Preheat oven to325 degrees and either butter, use vegetable oil spray, or line two 8×8-inch baking pans with parchment paper. Melt together the butter and unsweetened chocolate – microwave works well for this but don’t burn your chocolate! Stir in the granulated sugar, eggs and vanilla and beat very well. Stir in the flour, salt, and nuts if you are adding them to your brownies. Divide the brownie batter between your two prepared pans. Bake for approximately 40 minutes or until a toothpick inserted into the middle comes out with only crumbs, not damp batter. Let the pans cool on a rack before cutting. You can eat them warm from the pan with a dollop of whipped cream or ice cream. Cold, they stand up nicely to a dab of frosting and a walnut half or a Christmas-theme candy. At this point, you will have four batches of cookies stored away . . . children depending! Now is the time to round up the children and your cookie cutters. Preheat oven to 400 degrees. In a large bowl, cream butter and sugar. Beat in eggs and vanilla. Add baking powder and flour, mixing well. The dough will be stiff so you may have to blend the last bit by hand. Do not chill dough. Roll out a portion of dough to about 1/8-inch thick. Cut out desired shapes and bake on ungreased sheets for 5-8 minutes or until lightly browned. Remove from baking sheets immediately and cool before decorating. Mix sugar and milk thoroughly. Add corn syrup and incorporate well. Icing may be divided up and tinted according to your creativity. Colored sugar, sprinkles, bits of crushed candy cane, candied fruit or nuts can brighten up your cookies. Even when we are on schedule with a Thanksgiving meal, family and guests often plan their day around being able to eat enough of the holiday goodies and come hungrier than usual. It is nice to have something for everyone one nibble on while they wait for the main event of the day to be served. These crackers are tasty and entirely different from what the Thanksgiving fare will be so there you have some contrast! Me, I will eat cheese under most any guise and these suit me taste for cheese quite well. They can be addicting! Preheat oven to 375 degrees. Line baking sheets with parchment paper or use vegetable oil spray. In a mixing bowl, combine the softened butter and cheese. Stir in the black pepper. Add the flour, one tablespoon at a time. If the dough doesn’t come together, add it milk in small amounts until the dough forms a ball. Shape the dough into 2 approximately one-inch rolls on sheets of waxed paper. Roll into the waxed paper and refrigerate for about 30 minutes. Slice dough into about 1/4-inch thick rounds. Place on prepared baking sheets. Bake until lightly browned, about 12-15 minutes. Remove to cooling rack. Stained Fingers and Happy Snacking! Fall is my favorite season of the year. Believe me that in California you have to be alert for a crisp Autumn day as they don’t appear too often and are fleeting! Besides the holidays in the upcoming next two months, it is the appearance of pomegranates in the store that make me happy. It is one of my favorite treats. I clearly remember enjoying my very first pomegranate. I was around ten years old and saw this odd-looking leathery apple thing in the grocery store. My mother wasn’t sure about it but let me buy one. How amazing to open that first piece of fruit and see the many ruby seeds glowing against the creamy white membrane inside. It was totally unexpected but upon eating my very first seed, I was hooked. The memory of this day probably has something to do, too, with the fact that I was wearing a brand new white sweatshirt. By the time I finished my first pomegranate . . . Well, need I say more? Back in the time of mythical Mount Olympus, Persephone, the daughter of the Green God, Zeus, and Demeter, the goddess of the harvest, was abducted by the handsome god, Hades. Given the name of Hades, you can just imagine where he had his kingdom. Now, Persephone was a creature of light and vegetation. She liked being where Hades had abducted her from. The story goes that even though her cries of dismay at being stolen from her life could not be heard above the ground of Hades, her mother instinctively knew something was wrong. Depression deprived Demeter of her zest for living which resulted in no crops to harvest that season. Helios, the sun god who sees everything, told Demeter where her daughter was to be found. Zeus, tired of the cries of the hungry beings on earth, strongly encouraged Hades to return Persephone to her mother. 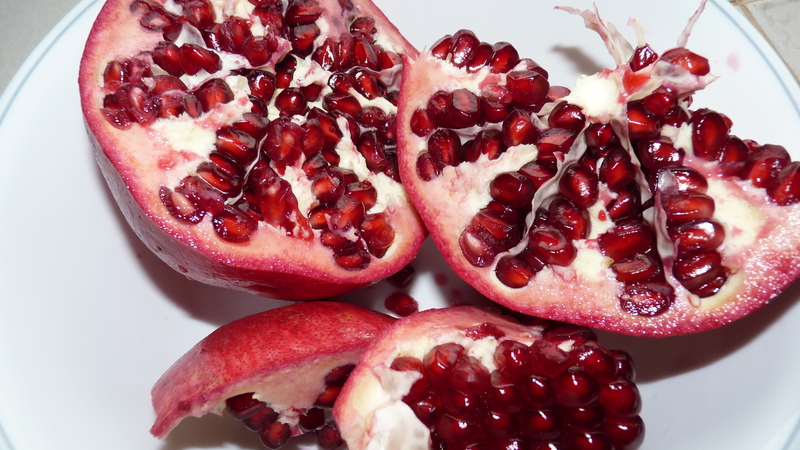 Given that during pomegranate season, I eat an average of one a day and don’t stop at six seeds like Persephone, it’s a good thing we aren’t in mythological times and I am not a temptation for any god! I eat more than six or so pomegranate seeds in a sitting. With the onslaught of holidays about to surge into place, time is of the essence and we are often called on to cook in spite of all the additional chores of the season. This is a favorite of mine that is relatively easy to do, can be adjusted to tastes, and appears on the dinner table on short notice. It also tastes good! Mix the ground beef, bread crumbs, onion, salt, pepper, Allspice, cayenne, and 2/3 cup milk together. Add the milk gradually so you have the right texture to hold the meat together for meatballs. Shape the meat mixture into small meatballs. Melt the butter in a large frying pan so the meatballs have room to cook. Add the meatballs and turn frequently to insure even browning. Remove the pan from the heat and sprinkle the flour over the meatballs. Gently stir to blend in the flour. Add the bouillon to the meatballs. Stir in the remaining milk with the Worcestershire sauce. Cook over low heat, stirring frequently until the sauce thickens. Serve over freshly cooked and hot egg noodles or your favorite rice. *A time saver is that you can prepare and refrigerate the meatballs the night before. *Want it gluten-free? Use cornstarch instead of the flour and grind up some gluten-free bread for the crumbs. Thy Will, Not My Will, Be Done . . . The media has been ablaze with the bravery of a young woman who, due to a terminal brain tumor, is carefully planning the time and day of her death. She doesn’t want to face the awful consequences of the final days of her illness, suffer the pains, and have her husband and family see her this way in her last moments. Reading her narrative and plans, I know that suicide is wrong but didn’t have words to explain it. Suicide always has some selfishness interlaced in it. A sudden, unexplained killing of one’s self leaves family and friends what they did to push you to this point. Such sadness can linger with no reprieve. A planned suicide only give momentary relief to loved ones as they suddenly feel the reality of it more strongly than anticipated. I think the young lady is thinking that ending her life at her chosen moment is a cleaner and more humane approach for all involved. It is hard to imagine that she totally believes in an after life as she will appear at Heaven’s gate before she is supposed to be called home to our Lord. This essay by a young seminarian explains the situation beautifully . . . and he should know as he has a brain tumor, too, yet has gone on with his life in spite of having a shorter expectation of life here on earth. He discourse makes one see pain and suffering in a new light. He shows how our sufferings can help those who support us in our last days. There are miracles on the death bed but not usually the ones we want but the ones God knows we need to progress into the next life. All in God’s time . . . Still hoping for some winter weather out here in California but already thinking about a brisk evening combined with a pot of hot, tasty soup. This is an easy recipe and can make four generous servings or smaller bowls for six. And, as you will note, completely gluten-free but no ‘weird’ gluten-free ingredients which makes it friendly to every diet! Melt the butter in a large cooking pot. Add the onion and saute until onion is softened and just starting to brown. Stir in the prepared mashed potatoes. Add the milk, stirring well to blend. Add the cheese of choice and the salt, pepper, granulated onion and granulated garlic. Keep on a low heat and stir until the cheese melts and the soup is heated through. Serve each portion with a sprinkling of bacon and the chives or green onions.